Susan Meyers has advised some of the most influential state and national leaders and reported on some of the biggest stories over the past 25 years. She now shares that experience to counsel politicians, corporations and non-profit organizations on messaging their stories as president of Oak Grove Communications. 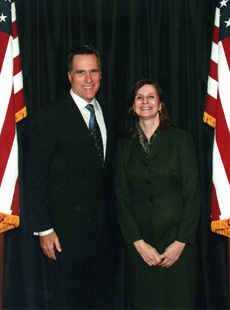 Susan Meyers led the Southeast media relations campaign for former House Speaker Newt Gingrich's 2012 presidential bid as well as Mitt Romney's Georgia press during his first presidential run in 2008. She also was Gingrich's communications director at his think tank, The Center for Health Transformation, leading communications in the fight against Obamacare and the overreach of big-government healthcare. Susan Meyers got her start reporting at The Atlanta Journal-Constitution before being named a member of its conservative editorial board. Her editorials on Grady Memorial Hospital not only led to needed change in Atlanta's healthcare system, but were nominated for journalism's top award - the Pulitzer Prize. Susan Meyers then took her skills to Georgia's Gold Dome, where she served as the Policy Advisor for the state House of Representatives. During her tenure, she helped draft legislation and communications for initiatives including Georgia's voter ID law and tort reform laws. In 2006, Susan Meyers founded Oak Grove Communications, where - in addition to her communication strategy work - she has helped improve the national school choice landscape. Meyers and Oak Grove led the media campaign to inform parents about Georgia's first school voucher program for special needs students. On a national level, Susan Meyers has been quoted in The Wall Street Journal, Fox News and others on behalf of Nobel laureate Milton Friedman's Foundation for Educational Choice. She also helped bring premier healthcare options to Georgia by leading initial communications for the opening of Cancer Treatment Centers of America's first hospital in the Southeast. Susan Meyers has a bachelors' degree in journalism from the University of Georgia and was a media fellow at the prestigious Hoover Institution at Stanford University. She previously served as a commentator on public television's "Atlanta This Week" and as a freelance editor at CNN.